To some, he is responsible for transforming the English game - "a great visionary", according to his former defender Martin Keown. To others, including the many Arsenal fans who demonstrated against him, his initial success petered out and he will be judged on a run of 13 years without a league title. So as Wenger now prepares for another season at the Emirates, how does his record stand up? He can claim to be the most successful foreign manager in English football's history. But for how long, now that bitter rival Jose Mourinho is back in the winning groove at Manchester United? Up until this season, Arsenal had finished in the top four in every one of Wenger's 20 seasons in charge, a feat no other club had managed during that time. And that partly explains why, during this period, the Gunners' four major competitors (Chelsea, Liverpool, Manchester City and Manchester United) have had a combined 42 managers. That ability to guarantee Champions League qualification held plenty of sway with the club's board, with all the financial benefits that come with being in Europe's premier cup competition. But at times that consistency has masked a lack of competitiveness in the title race. Wenger's suggestion in 2012, following an FA Cup fifth-round exit at Sunderland, that finishing fourth was as good as a trophy - "the first trophy is to finish in the top four" - has come to be viewed as characteristic of a club that can - at the moment - no longer be considered genuine title challengers. Indeed, in 11 of his past 13 seasons, Arsenal were 10 or more points adrift of the champions. Despite getting them into the Champions League with remarkable regularity, the major omission from Wenger's Arsenal CV to date is a European trophy. Although he has won seven of 12 finals as Gunners boss, none have come in European competition. He guided the club to the Champions League final in 2006, when his 10 men were 14 minutes from beating Barcelona before two late goals ended their hopes. And that has been as good as it has got for Arsenal, who have gone on to become stuck in a seemingly never-ending cycle of group-stage qualification followed by last-16 elimination. The Gunners' 10-2 aggregate defeat by Bayern Munich this season was their seventh consecutive last-16 exit. It is a cycle that will end next season with Arsenal absent from the Champions League. And, who knows, the Europa League may even provide a route to Wenger's first European trophy. Has the second half of his tenure been a failure? When the Gunners went all of 2003-04 unbeaten in the league, ultimately setting a new record of 49 games without defeat in the top flight, it was the latest chapter in Wenger's impressive Arsenal story. But there has been no league title since and, after the FA Cup triumph of 2004-05, Arsenal endured a run of nine years without a trophy, a sequence ended by three FA Cups in the past four years (2013-14, 2014-15, 2016-17), as well as two Community Shields. So is it right to say Arsenal have performed significantly worse in the second half of his reign? Their record is actually remarkably similar in that period to the first decade under Wenger. But it is the difference in trophies won where he is judged - 69% of them came in his first 10 years. Part of that failure to win trophies can be attributed to the Gunners' performances in the "big" games - the matches against direct title opponents that can play such a significant role in shaping a title race. Manchester United, Chelsea and Liverpool have all been title contenders across both parts of Wenger's reign (Tottenham and Manchester City were not in contention during Wenger's first decade). And, despite remaining a consistent presence in the top four, it turns out the Frenchman's strong record in such matches has slipped over time. Finishing outside the top four was not the only first for Wenger this season - it was also the first time during his tenure that Arsenal have finished below Tottenham in the Premier League. Wenger enjoyed two decades of dominance against the Gunners' north London rivals. In fact, he only lost once in his first 14 years of league meetings against Spurs. Spurs' victories in the fixture have become more frequent in recent seasons and they almost finished above Arsenal at the end of 2015-16, only dropping below the Gunners on the final day, thanks to a shambolic 5-1 loss at already relegated Newcastle. But this season Arsenal could not resist. 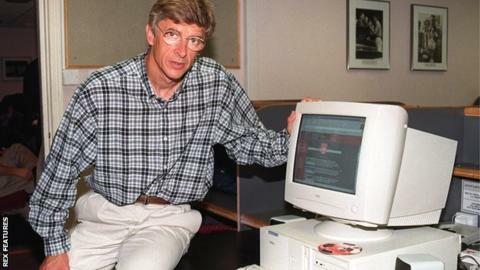 Wenger's proud record of local dominance was at an end. Wenger has often been accused of failing to pay the necessary money to strengthen his squad when it matters, most notably when his bid of £1 above Luis Suarez's £40m release clause prompted Liverpool owner John W Henry to tweet: "What do you think they're smoking over there at the Emirates?" Wenger said in August that he believed "the only way to be a manager is to spend the club's money as if it were your own", and he built a reputation for financial prudence. So do the figures back up that notion? The Gunners consistently spent less than their main Premier League rivals. In fact, they have only outspent Chelsea in a season four times during the course of his 20 years in charge - and not once since 2009. Indeed, Wenger spent more than £60m in a season only twice. Chelsea, Liverpool, Manchester City and Manchester United have done it 34 times in total between them. Wenger believes he only needs one or two players of the highest quality to make a fresh assault on the Premier League title - so will that statistic change this summer? Arsenal's move to Emirates Stadium from Highbury in 2006 is usually cited as the main reason for Wenger's cautious approach. In the six years either side of that move, Arsenal paid a total of £122.79m in transfer fees. Chelsea twice spent more than that in a single season during that period (£142.35m in 2003-04 and £138.89m in 2004-05), and have spent more than double the amount their London rivals have paid in transfer fees in the years since Wenger's arrival in England. Perhaps because of that, Wenger's record is less impressive since the move - though there is not much in it. "One of the frustrating things for the fans is that the new stadium hasn't given them what they expected it to give them," said Keown. "When I left in 2004 I was disappointed. We'd just gone a whole season unbeaten but I was thinking there would be this train through Europe and they would just dominate. It didn't quite happen. "Maybe that was down to the financing of the stadium and maybe there were not enough risks taken financially. You can never blame anyone for that but maybe they could have better speculated to accumulate." Is he too loyal to his players? Ensuring Arsenal's successful evolution beyond the 1998 double-winning team and the Invincibles was never going to be an easy task. One accusation levelled at Wenger is that he is not ruthless enough and is too loyal to players in whose development he has invested time and energy. While it is hard to judge exactly when a player is past his best, it is certainly the case that Wenger's Arsenal have been more likely than any other leading club to keep players for longer. And, none of the top clubs have used fewer players in that period than the Gunners. It is the failings of the current group of players and their inability to challenge for the title which has so angered some Arsenal fans, and something Wenger must address to prevent the same questions arising next season. What next for Arsenal and Wenger? Read more on Arsenal win the FA Cup: What next for Arsene Wenger and the Gunners?